Due to the heavy reliance on video examples it was insufficient to simply post slides of the session I gave at the Montreal International Game Summit in November, so here is the full write-up outlining a proposal for a different approach to cutscenes as a form of delivering cinematic experiences in videogames. First, a little bit of background about where I’m coming from. I’ve been working on games now for nearly a decade in a variety of both in-game and cinematic roles, with the in-game side mostly focussing on player control, cameras and animation-system design relating to gameplay, whereas the cinematic part is about pure art and storytelling, getting information across to the player in as efficient a manner as possible. At the time of the presentation, our team was wrapping up the final stages of production on cutscenes for Mass Effect 2 and here’s an image of the wall behind my desk. 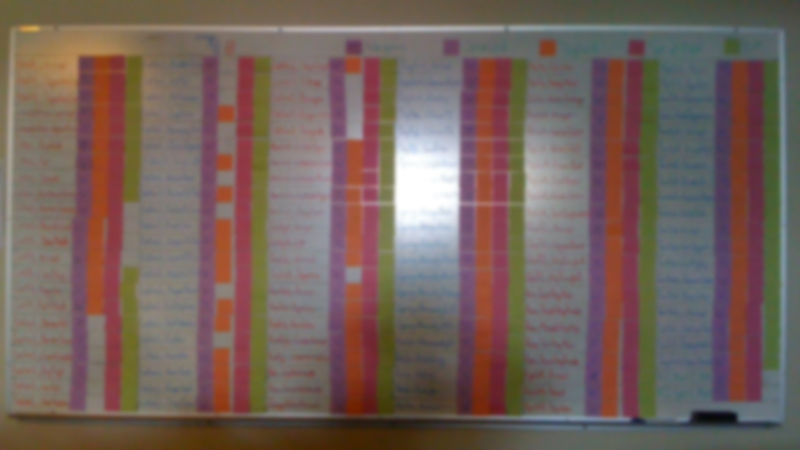 This was a deliberately blurred picture (so as to not give away any spoilers) of our workload as it stood, with only the last few bugs remaining and each of those lines there representing anywhere between 1 and 7 individual cutscenes, many of which we now know post-release were well-received cinematic experiences. However, with such a heavy history of in-game animation design, I feel that with games like ours and the recently released Uncharted 2 among others, we’re coming to the limits of where we can go with pure cutscenes in our games. Uncharted succeeded with its seamless transitions into and out of cutscenes, as well as the sheer high quality of the characters and acting, and ours with the logic behind them that decides which sequences (and how) to play depending on choices. As animators, we didn’t know whether your player-character was male or female, what their face looked like, or who you’d brought along with you on your team, not to mention the myriad choices that you can make throughout the game that will determine the outcome of particularly climactic scenes. After this point I can see cutscenes only limiting our progress in terms of developing storytelling in games, so I’m interested in exploring alternative methods that will allow us to truly develop stories for our medium rather than continually within the pre-established constraints of film – which are essentially where cutscenes lie. When researching this topic, I began by initially trying to define exactly what a “cutscene” is. I’m sure when we’re all watching one we can tell that it’s a cutscene, but we have had so many variations of them over the years that it’s difficult to define them in a pure sense. The first and most natural idea that springs to mind tends to be “whenever the camera cuts”, but this is not the case as we often have no cuts, particularly during “designer cutscenes” whereby the camera simply transitions to a location to show the relationship between the player and the subject. Next is to assume that player control is removed entirely, but as we’ll see later there have been many attempts to include some level of interactivity during cutscenes that doesn’t detract from them being cutscenes. The creation method is irrelevant – we have different terms in the industry such as Cinematic Cutscenes, Designer Cutscenes, Ingame and Pre-rendered, but in the end what really matters is how the player perceives the result, of which length is a sizeable factor. Below is a great example of a cinematic sequence from Resident Evil 4 that follows all the “rules” of what we typically consider to be a cutscene, but because of its short duration the player doesn’t consider this a cutscene, and instead just another cinematic moment that contributes to the overall feeling of the game being a cinematic experience. As such, a better approach is rather than to define what a cutscene is, instead to define the problem, so hopefully we can concentrate on simply attempting to overcome the issue rather than arbitrarily abolishing cutscenes themselves which has been done in the past to greater and lesser degrees of success. Control and choice is restricted, if not removed entirely. One second the player is running around, making choices and personally involved in many aspects of how the story or adventure is progressing, then the next they are force-fed exactly what we as developers want them to see and experience. This is fundamentally against the nature of our medium, and greatly restricts their experience for the duration of the cutscene back to the levels of the older medium of film. Cutscenes make a clear division between the gameplay and the story. The visual difference between cameras (and often character fidelity) in gameplay and those for cinematic cutscenes negatively reinforces the fact that most of gameplay involves little to no story progression at all. Once a cutscene is triggered, often without the player’s consent or choosing, his or her only option is to exit the cutscene. This brings with it issues of missing important information after the point of exit, and more importantly highlights the fact that we have a major problem here. If we have a design element in our medium that consistently requires we add the option to skip it entirely, then surely there is something fundamentally flawed with some aspect of that element? This brings me to the definition that cutscenes are essentially “Imposed Cinematography”, whereby we as developers wish to impose narrative or progression information required to continue, or to ensure that the player experiences a part of the game exactly as we wish them to. This is the heart of the conflict between developer and player where, unlike other older mediums, we perform best when we play to our strengths and require participation from the player rather than purely imposing our creative will upon them. This was a great article. Thanks! If you want to give players full/complete control of the camera, and yet encourage them towards artistry in their game experience, then it makes sense to reward players for doing so. That is, you could make cinematic shot composition a system in the game that can be mastered. Of course, such a system has the usual negatives: you abdicate to players the “ability” to have a sub-optimal experience, and you deal with trying to quantify and program “artistic sensibilities”. On the other hand, in the best case you encourage players to see the most cinematic version of events, and convince them that it was their choice to play it that way (even when there wasn’t ever really a choice). Players may not have the artistry necessary at the beginning of the game, but as with nearly any other game system, if you give the players the right feedback and the system is well tuned, you can train the player towards mastery. In such a system, I think the dominating issue becomes not so much the player’s artistry as the player’s dexterity to perform expected movements and game choices (all for appropriate “editing”) in real time, depending upon the complexity of the system design (and composition powers awarded to players). Gears of War’s “Y” system is an example of such a system design. Better examples, I think, are the “camera modes” of Dead Rising and Beyond Good and Evil. Both games reward players for taking interesting “photos” with still-photo cameras (even/particularly during key cinematic moments). I’m wondering if there are lessons from these camera modes that can be pulled out and generalized to normal game play moments, rather than only used in sniper-like photo-journalism mini-games. Anyway, I really appreciated your article and really wanted to point out the Dead Rising/BG&E examples and the idea of trying to “make shot composition a game (system) that players can master”. While it does sound like a cool idea to fit photography into the fiction, I’ve played in in Beyond Good & Evil, Dead Rising, Bioshock and the Fatal Frame series and by pushing the accepted compositional limits have found each to be VERY forgiving in terms of subject positioning. This is almost certainly the result of user-friendliness to avoid alienating players who don’t understand even basic composition, and I fear that teaching it in tutorials and/or as part of the narrative will still prove inaccessible to most players. This is reinforced by an industry-wide shift in all areas of game design to place a high importance on accessibility – not just to appease the lowest common denomination of player, but to allow us to concentrate on higher-level problems without worrying if the player can understand even the basics. What I’m really looking for here is a universal solution (or if not that, at least a universal philosophy) that can allow us to get closer to the core of what games do best in terms of storytelling without always falling back on the crutch of film-based cinematography, and I’m afraid having to add even basic camera-handling on top of the other things a player must master to access our stories is rather undesirable.